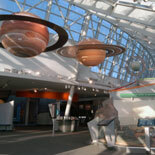 The Adler Planetarium and Astronomy Museum is located on scenic Northerly Island on Lake Michigan in Chicago, IL. The Adler is a National Historic Landmark and is named in honor of its founder, Chicago businessman Max Adler. The Adler Planetarium is part of Chicago’s well-known Museum Campus along with the Shedd Aquarium and the Field Museum of Natural History. Max Adler, a senior officer with Sears, Roebuck and Company, wanted to fund a public facility that would benefit his fellow Chicagoans for generations to come. He had heard about a device that had been developed in Germany in 1923 that could closely replicate the features of the night sky. He traveled to Germany in 1928 to see a demonstration of this machine along with his friend, architect Ernest Grunsfeld. He was very excited and impressed by the device, and decided to donate the funds to construct the first modern planetarium in the United States and the Western Hemisphere in his hometown of Chicago. 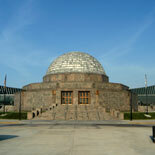 The Adler Planetarium was opened to the public on May 12, 1930, and in his dedication address, Mr. Adler explained that he had undertaken this project because he wanted to enrich the lives of those living in Chicago, and to expand man’s knowledge of space, the stars, planets, and the universe. WHAT WILL VISITORS SEE AT THE ADLER PLANETARIUM AND ASTRONOMY MUSEUM? The Adler Planetarium houses a wide variety of exhibits, shows, classes, and interactive activities. The museum has so much to offer, it is almost impossible to see everything in just one visit. The Adler Panetarium’s numerous exhibits are sure to educate and entertain visitors of all ages. You’ll also enjoy the one-of –a-kind interactives available as you examine these highly advanced instruments. Planet Explorers, one of the permanent exhibits, children will become space explorers and have an adventurous journey through the universe on their destination to a mysterious planet. They’ll enjoy some physical activities and the flying and landing along the way! Cyberspace is a very unique experience. This exhibit features computer-based interactive exhibits, VisionStations which offer realistic immersive experiences of the universe, and much more. This exhibit is at the forefront of the Adler’s Center for Space Science Education, and is supported by NASA. Other exhibits include Bringing the Heavens to Earth, showing how various cultures throughout time have studied astronomy and the universe; Our Solar System allows you to drive a Mars rover and participate in more computer interactive activities; Shoot for the Moon features the fully restored Gemini 12 spacecraft; the Space Visualization Laboratory allows visitors to attend presentations by astronomers and experience the latest technology used in exploring and capturing images of the universe. In addition to these fun, high-tech exhibits, the Adler Planetarium has three theaters. The Definiti Space Theater provides an exciting virtual reality environment that shows you the outer reaches of space. You’ll want to see the feature, Cosmic Collisions hosted by Robert Redford. The Sky Theater experience allows you to see the clear night sky projected on the dome of the Adler Planetarium’s historic Zeiss theater. The Universe Theater is currently showing two 3D shows--3D Universe: A Symphony and 3DVision: Imaging the Universe. Other highlights of the Adler Plaentarium include The Doane Observatory, housing the largest aperture telescope available to the public in Chicago; the North and South Terraces for observation of the sky and city; Sundial Plaza, featuring a fully functional 13’ sundial; cafes, gift shops, and much more.